by Music-News.com NewsdeskDavid Bowie's bandmates have confirmed he closed out his final tour after suffering a mild heart attack onstage. The late rocker's pals have opened up about the secret health emergency in new TV documentary David Bowie: The Last Five Years, revealing the Heroes singer ended the lengthy Reality Tour at the 2004 Hurricane Festival in Germany clearly ill and with very little energy. Guitarist Earl Slick reveals his longtime pal was happier and healthier than ever when the tour began in 2003 - and the shows, including one at Britain's Isle of Wight festival, were electric. "It was just not the (serious) David I had known in previous years," he says. Gerry Leonard adds, "There was a sense that David looked as young and as youthful as ever on that tour. It did seem like he had the gift from the gods; that he was never gonna get old" and that made what happened onstage during a show in Prague, Czech Republic tough to take. Slick recalls, "He started to hunch over and looked over and I looked over at him and I went, 'There's something really wrong', and I signaled to his tour manager..."
Bassist Gail Ann Dorsey adds, "The security person ran out and took him off the stage." "It was a little mysterious to everybody as to what it might be, because it really did come out of the blue," Leonard shares. Bowie brushed off the health drama and joined the band for what would be his final full concert at the Hurricane Festival in June, 2004. "We played the entire set and it seemed normal, not quite as energetic and as charged as the performances before," guitarist Leonard explains. "We finished the show and then it seemed like David was in a lot of pain and obviously something was wrong." Dorsey adds, "They sent an ambulance and took him away..."
Slick reveals the band was told Bowie had suffered a mild heart attack, but his life wasn't in danger. The health scare prompted the Let's Dance rocker to put his music career on hold and he told close friends he may never record another album. He also lost touch with his bandmates. "We would exchange emails about things that were interesting to each other... but there wasn't a lot of contact," Leonard explains. 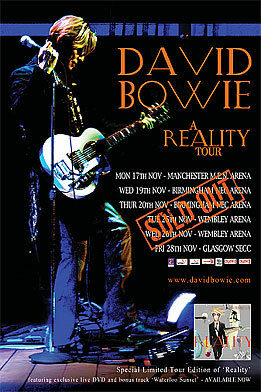 Bowie eventually regrouped his band in 2011 to start work on what was to become his penultimate album, The Next Day. The new film, released on the second anniversary of Bowie's death, features unseen home video footage shot during Bowie's final tour and footage of the rock icon in his final years. The rocker lost his battle with cancer on 10 January, 2016.